Trim ends of the zucchinis and grate them or slice on a julienne slicer. Place in a colander and mix with coarse salt. Set a side for about 10 minutes. Meanwhile, make the yogurt dressing by mixing the yogurt with lemon juice, season with salt and freshly ground pepper. Now wring out the zucchinis, by either pressing it against the holes of the colander to extract the water or wrapping them up in a clean dishtowel and squeezing out the excess liquid. Mix the zucchini with the finely chopped scallion and beaten egg. In a small bowl, stir together flour and baking powder, then mix with the zucchini mixture and season with freshly ground pepper and if needed some extra salt. Toss the rocket with olive oil and season with salt and pepper. Heat the oil in a frying pan and ladle spoonfuls of the batter into the pan and cook for 3-4 minutes on each side. Transfer cooked fritters to a paper towel to drain excess oil. 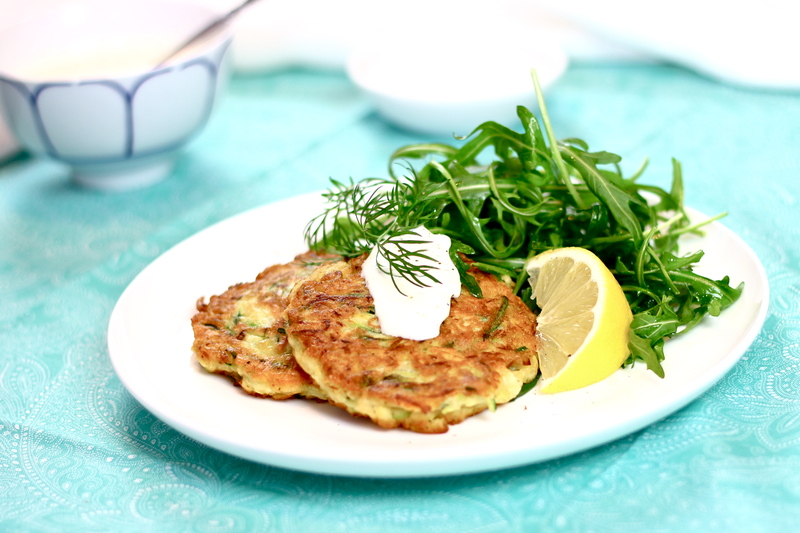 Serve with the yogurt dressing and the rocket. I like the way you have presented this recipe – very clear and easy to follow. Thanks! Yeah, I love Meat Free Mondays, such an easy way to eat healthy and at the same time be kind to the environment. I have to try these! Some one once give me a recipe that was made with zucchini and was suppose to taste like crab cakes. I now need to see if I can find that one again! Thanks for sharing a great idea! These look really good, and I do love a simple recipe! Thanks! Yeah they are so easy to make and real tasty too.